I like interesting landforms (like the previously featured Apo Lakay-lakay) so here’s another one: the sandbar at Puerto Galera. This is a tiny isthmus that connects the island of Mindoro with Boquete Island whose old name is Paniquian Island. To the east are the waters of Muelle Bay and to the west is the Little Balateros Cove. While Boquete Island is technically a peninsula, it supposedly becomes an island during high tide. However, I think it would need a really high tide to become an island since it seems that the sandbar is quite high basing on photos I see. Perhaps during bad typhoon storm surges? Photo from the Sandbar Beach Resort website. But is the Sandbar Beach Resort any good? A commenter at the Pinoy.Travel.Blog cries “Beware!” while a blogger finds it better than the “noisy, sweltering, fly-infested and overrated White Beach”. I haven’t personally stepped foot on this beach resort since I’ve always stayed at the “fly-infested” White Beach during the three times I’ve been to Puerto Galera so I guess you have to check the Sandbar Beach Resort out on your own. But still, don’t you find the idea of choosing among two beaches interesting? i think sandbar beach resort will be the best place for my family this summer. can i ask their contact nos.? the one i have is no longer functioning. thank you very much for your help. 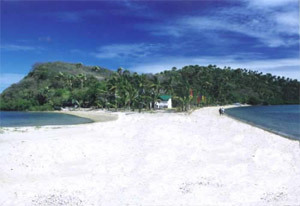 Sandbar is one of the best resort in Puerto Galera. I like the rooms in particular bcause they are newly renovated. It is way better than the white beach.i would recommend this resort. Though, it’s a little expensive (4000/night/room). But it’s all worth it. I just don’t like the food, but it’s tolerable. can i have the contact details, website of sandbar? Does it close to the sailing school? bastos at walang modo ang may-ari ng SandBar Hotel & Resort sa Puerto Galera! Galit sya sa mga bakla! di sya marunong rumespeto ng iba! wag kayo pupunta sa lugar na yan, di kayo safe! masamang tao ang may-ari nyan! I strongly recommend this place! They are all accomodating and hospitable. They allow you to use their ammenities and facilities in a very low rate or sometimes for free. The owner very simple as well as his workers. I just love the locals there, amazingly awesome! We stayed in Sandbar the whole summer of 2009. My brother actually rented the big cottage for i think 6 months. We even brought our appliances like (Ref, TV, Stove, electric fans). We love sandbar because it’s safe and not noisy like the white beach and the staff there are very friendly. hope we can visit there again.